For those seeking a strong exfoliation coupled with a slimming action look no further than the Caudalie Crushed Cabernet Scrub, Vinotherapie Spa’s signature scrub. With an all natural formula this scrub smoothes out cellulite and has a draining effect. 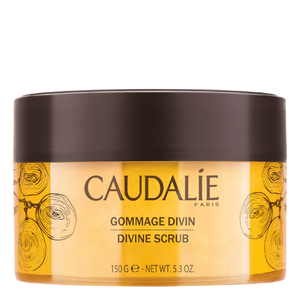 Containing crushed grape-seeds mixed with brown sugar, pure gironde honey, and six organic essential oils the Caudalie Crushed Cabernet Scrub smoothes out cellulite and has a draining effect to leave your skin wonderfully smooth and nourished. Use twice a week, before the Caudalie Contouring Concentrate to intensify its action. Massage your whole body with circular movements and rinse with care. Twice a week, apply onto wet skin. Massage onto the entire body, paying particular attention to the stomach, hips, and thighs, then rinse thoroughly. Crushed grape-seeds, brown sugar, grape-seed oil, Gironde honey, essential oils of lemon, lemongrass, geranium and juniper organically grown. This Caudalie Crushed Cabernet Scrub is definitely a great scrub. I have very sensitive skin and this product is perfect. It leaves my skin very soft and smooth with a revived complexion without causing any redness or irritation. The smell is divine every time I open the pot it's like being in an expensive spa! I didn't give it 5 stars simply because the pot is a bit small and doesn't last very long...having said that, a little goes a long way! Will definitely buy again! Highly recommend. This is a great scrub and smells really good. It does what it should but it is a bit too expensive for a 150g jar. Beautiful product! It has the most wonderful scent, natural, organic, fresh and sweet. It is a really good scrub to get rid of all the dead skin cells but it is also very gentle to the skin. Feels very luxurious when you use it and I love that feeling! I do like the way this makes my skin feel when I use it but don't really feel that there is any change to my skin. And its a good thing that you only use it twice a week cause it wouldn't last long otherwise.